Trump has trashed them, but some experts say the group has an impressive track record. Trump has complained that the team is made up of "some very bad and conflicted people" because 13 of them are registered Democrats, and several have made donations to Democratic candidates. Justice Department officials, however, are not supposed to ask about employees' political affiliations. Department policy prohibits "using political affiliation and may also prohibit using certain ideological affiliations in hiring and taking other personnel actions with regard to career attorneys," according to the department’s inspector general. Goldstein, a former Time magazine reporter and high school teacher, also prosecuted the CityTime case, involving an automated timekeeping project for New York City employees that exploded in cost from an expected $63 million to more than 10 times that in what the Department of Justice called “the largest municipal fraud and kickback scheme in history.” The probe, the department said, was "a dogged investigation that involved tracing payments through more than 150 foreign and domestic accounts, poring through hundreds of thousands of emails and project documents, interviewing more than 100 witnesses, and securing cooperation from two key insiders." But Goldstein was also involved in the 2017 decision not to charge New York City Mayor Bill de Blasio in a bribery probe even though a campaign donor pleaded guilty to trying to get favorable treatment through his contributions, The New York Times reported. While court documents said de Blasio took steps to benefit the donor in exchange for the contributions, federal prosecutors decided not to pursue charges against him because of "the high burden of proof" and "the particular difficulty in proving criminal intent in corruption schemes where there is no evidence of personal profit," Goldstein's then-boss, acting Manhattan U.S. Attorney Joon Kim, said at the time. "He [Basciano] said Greg Andres destroyed the Bonanno family, he ruined all our lives," cooperating witness Generosa Barbieri — AKA "Jimmy the General" — testified in Basciano's 2011 murder trial, according to the Daily News. "He said we should make an example of him." Zainab Ahmad also worked in Brooklyn U.S. attorney's office, where she focused on terrorism. That work included negotiating with foreign officials and interviewing witnesses overseas. "Everybody’s human. You pull the levers,” she told The New Yorker in 2017, referring to terrorists. The magazine reported that she had prosecuted 13 people for terrorism since 2009 and never lost a case. Aaron Zebley is another WilmerHale alum and is especially close to Mueller; he was his chief of staff at the FBI. Zebley is also a former FBI agent who was involved in an international hunt for al Qaeda terrorists before the Sept. 11, 2001, terrorist attacks. He continued probing al Qaeda from FBI headquarters after the attack and later worked in the DOJ’s national security division, which oversees counterterrorism and counterintelligence investigations. 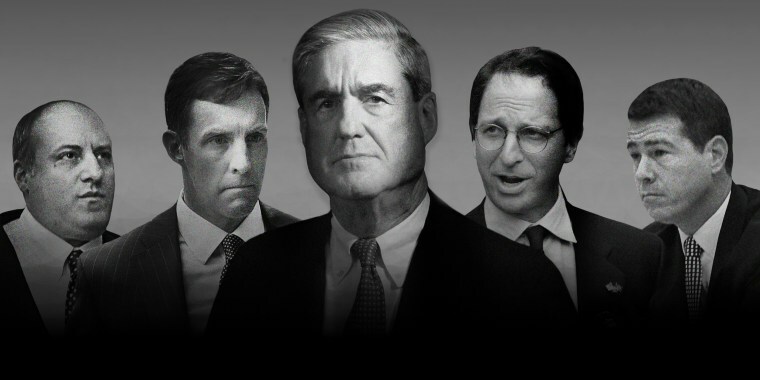 Aaron Zelinsky, who comes from the U.S. attorney's office in Maryland, has played good and bad cop while questioning witnesses in the Russia probe, some of those witnesses told MSNBC's Ari Melber. Zelinsky, who has clerked for Supreme Court Justices Anthony Kennedy and John Paul Stevens, was professional and asked appropriate questions, former Trump campaign adviser Sam Nunberg told Melber. Another witness, Jerome Corsi, said Zelinsky was "a thug" who was "acting up" during his questioning. Adam Jed worked as an appellate lawyer in DOJ's civil division and has experience in asset forfeiture. In the Mueller case, the Harvard Law graduate has reportedly worked to keep some documents sealed from public view. Like Zelinsky, he has clerked for Justice Stevens.